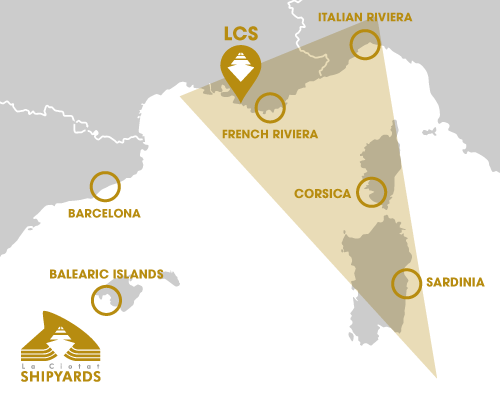 La Ciotat Shipyards is located in the area of preference of global yachting. To the East, the French Riviera, the Italian Riviera (Portofino) and Sardinia (Porto Cervo), which make up the famous Golden Triangle of luxury yachting, main destination in the Mediterranean for Yachts, Super Yachts and Megayachts. To the West, the prestigious harbors of Barcelona, ​​the Balearic Islands (Mallorca, Ibiza …) and Marbella offer another perspective, equally appealing, of the Mediterranean. It is estimated that 2/3 of yachts over 24m sail in the Mediterranean and more than half have their home port based in Europe. This proximity, combined with the variety of expertise present at the shipyard make La Ciotat Shipyards the ideal site for the refit of Yachts and Megayachts.